Who doesn’t love a good pizza? It can definitely be a great way to enjoy your evening making a pizza for the family or for your friends. If you have a pizza oven you can even get a better quality pizza than making it in the oven (or buying it from a regular pizza place). But how do you know you’re getting a great quality pizza oven? You don’t want to spend a lot of money on something that doesn’t give you great pizzas, after all. So take a look at each of these features and then our top pizza ovens. Fuel Source: What type of fuel does it require? Is it electric? Gas? Does it use wood pellets? You want to know what type of fuel it needs so you can be prepared before you buy it. This is a personal preference for most people. Dimensions: How large is the oven? You want something that will make a big enough pizza but you also want to make sure you actually have the space for it. After all, you don’t want to get something home and realize it won’t fit. Type: What type of oven is it? Does it sit on your counter? Is it a convection oven or a clay oven? You need to know these things to know how to put it out and how it’s going to actually make the pizza and what kind. Placement: Is it an indoor or an outdoor oven? This is going to be a personal preference but you need to know where you have space and where the oven is going to go before you start shopping around to find something. Max Heat: What heat does it go up to? This is going to affect the type and quality of the pizza that you make, after all. You want something that is going to get hot enough that you can actually cook a nice, crispy pizza. Weight: How much does the oven weigh? If you’re going to have to move it at any point you want to make sure that you can lift it. Knowing the overall weight is going to help you prepare for whatever you need to do. There are actually a lot more pizza ovens out there than you might think. Each one is going to give you a little bit different results, but they’re all going to make sure you have something great to eat. The most important thing is to take a look and see what you like the best. We’ve done some of the work for you and found the top ten options when it comes to home pizza ovens. So make sure you take a look. Our top pick is one of the best-rated pizza ovens available. It can heat up to the top temp of 930°F in just 10 minutes, which means it’s going to be ready to go when you want it. You’ll be able to cook more than just pizza’s too because it’s great for anything from meat and vegetables to seafood. All you’re going to need are wood pellets, which are energy efficient and sustainably sourced. Fill up the hopper, start it up and get your food prepped to go in. It can sit on a counter outdoors with the three legs that keep it steady and the stainless steel material that keeps it durable and strong. This lightweight unit is going to make it easy to move around and even take with you if you want to travel. You’ll be able to assemble it quickly and easily and you’ll be able to empty out the ash hopper just as fast. This is one of our top pizza ovens for a number of reasons. It’s a convection oven that fits easily on your countertop. All you need to do is plug it in and you can get up to 450°F. You get multiple racks and areas for cooking, including the oven itself and the pizza drawer. There are also separate trays for crumbs with both the top and the bottom section, so you can make sure you’re getting everything cleaned out before the next time you want to use it. Not to mention you’re getting a baking pan and rack that doubles as a broiling pan. You’re going to have a 60-minute timer with an auto-shutoff and a bell signal so you know when your food is ready. The stainless steel material is designed for improved quality and durability and it keeps the whole thing lightweight. Here you’re getting one of the top-rated pizza ovens and it’s something you can use easily as well. This moderately priced oven is made to sit on a counter outdoors, where you’ll have plenty of space to cook your favorite pizza and more. It’s made with a steel frame and has a pizza stone made of cordierite. That means you get a pizza that’s crispy and tastes great. You’ll need a propane tank to get it up and going but then you’ll have the maximum heat of up to 500°F. With the moderate weight and size, you’re also going to have plenty of versatility and portability as well. The gauge on the top will let you know the temperature and the dial on the front lets you adjust it the way you need. This pizza oven also comes at a moderate price, which means it’s something you can afford for your next special event. If you’ve ever thought about having a pizza oven this might be just what you’ve thought of because it looks like the old style version. You’re definitely going to love the look that fits great on your patio or in your backyard. This fireplace requires you to have the wood necessary to keep it going, but that means you won’t have any maximum when it comes to heat. Your oven can just keep going up. If you want to remove the cap you can even use your pizza oven as a grill to cook just about anything you want. The fiberglass lining keeps the heat in when you need it and the stainless steel of the grate is ideal for grilling. You’re going to have everything you need to get it going but you won’t even need any tools to get it there. 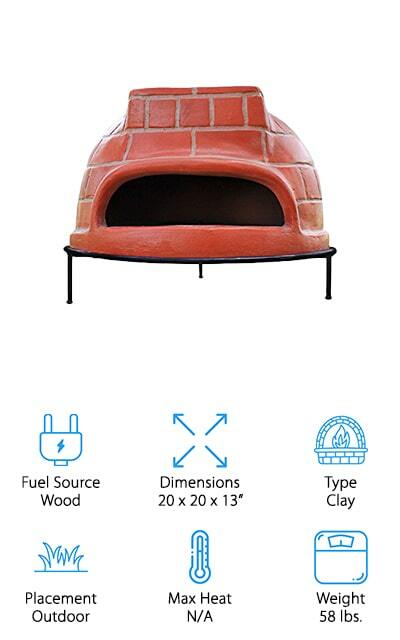 This is one of the best pizza oven options we have and it’s moderate in price. This convection oven is great for indoor use and provides you with up to 500°F of heat. That means you’re going to get plenty of heat and you’re going to have a crispy pizza every time. You’ll get one-touch heat at 450°F in just 10 minutes, which means you can get ready to cook just like that. You also get to make adjustments from 150°F to 500°F in 25° increments. There’s also a long life heating element that gets up to heat and maintains heat easily. Lightweight and made with high quality metal, you’re going to have something you can count on to last and that you can count on to move easily. You’ll have a rustproof design and an LED display as well, to let you know the current temperature. 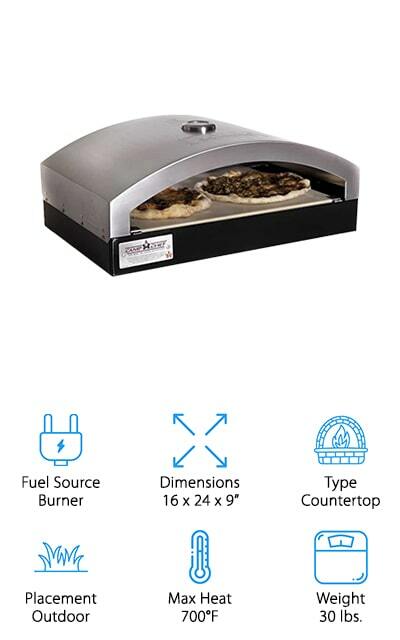 These unique countertop pizza ovens are definitely going to be a great addition to your home and will provide you with the crispy pizza that you’re looking for. 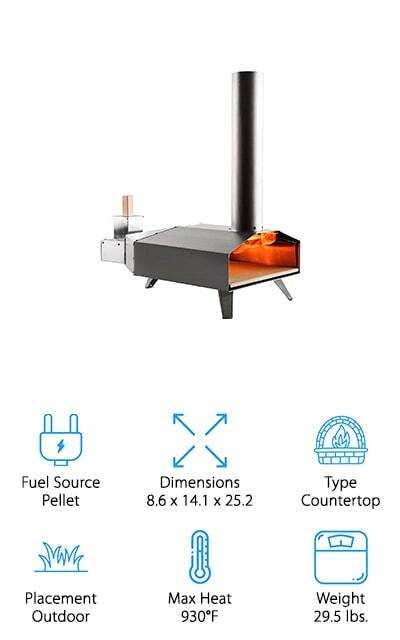 It fits easily on any counter inside your home and provides you with a unique rounded upper section that helps to reflect heat back down onto the pizza. You’re going to have a pizza stone included inside and stainless steel material for the frame of the unit as well. 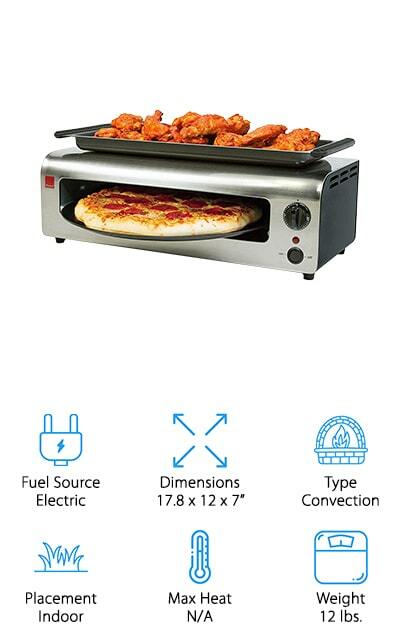 Capable of heating up to 700°F, it’s going to provide you with the right temperature for the ideal type of pizza. This lightweight unit is actually gas powered and provides you with up to 12,000 BTU. You’re going to have a system that can easily hold the pizza that you want to cook and you’re going to have something easy to clean as well. This just might be the best pizza oven for home for anyone who wants versatility and a simple to use oven. It’s an outdoor oven that fits easily on a counter because it’s moderate in size and even has a low level. 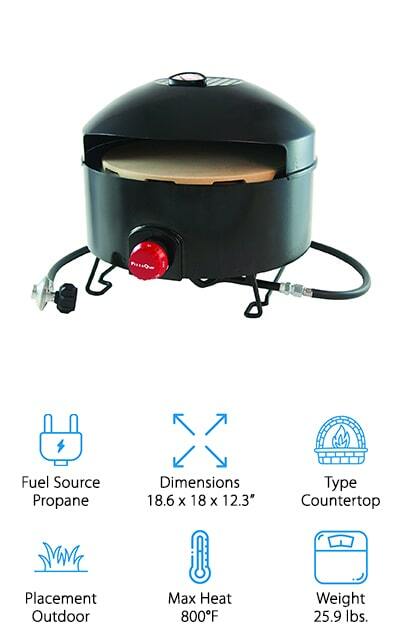 It get up to 700°F to give you a crispy pizza and also operates on a burner, so you always know that it’s going to run and you won’t need anything else to hook it up and get it started. The open-faced design is traditional and it comes with a ceramic stone that gets rid of moisture. At 30 pounds you’re still going to have the ability to move the oven around wherever you need it and even take it with you if you’re going to travel. It gives you full control over the heat and cooks everything from artisan to premade and even frozen pizzas. You may be surprised at these pizza ovens for home use because they’re not only high quality but they’re inexpensive as well. Available in 3 different colors to match the look of your kitchen, this oven is also a convection design that gives you crispy pizza with no maximum to the heat level. 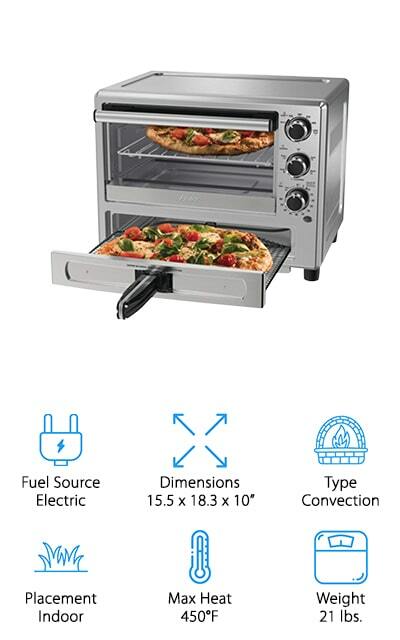 It provides dual heating above and below to get the pizza (or anything else you want to cook) done more quickly and also has a warming tray and pizza pan included. You’ll have a 30 minute cooking timer that provides an automatic shutoff but you’ll also have rotation to cook evenly. This lightweight system is electric and lets you move it around easily or even take it with you when you’re heading somewhere new. It’s definitely going to provide you with some great options for parties or even everyday dinners. These super unique pizza ovens aren’t gas pizza ovens, but they’re definitely great fun. 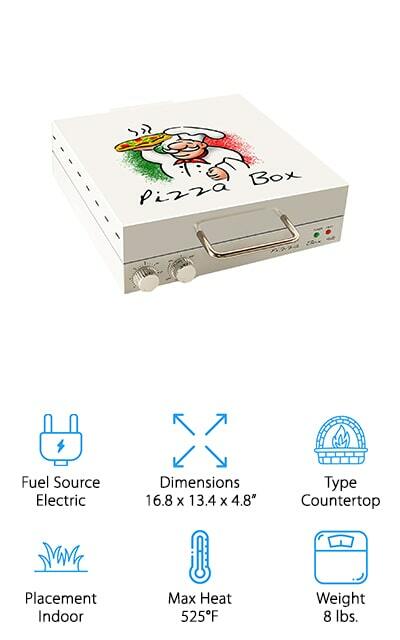 You’re going to have an oven that looks just like a pizza box, so you know exactly what you’re getting and your family definitely knows that they’ll love it. 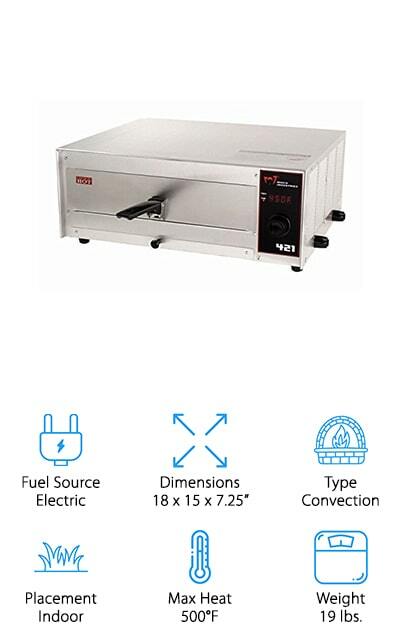 Inexpensive and easy to set up indoors, this countertop, electric oven is super lightweight and still gets up to a maximum heat level of 525°F. 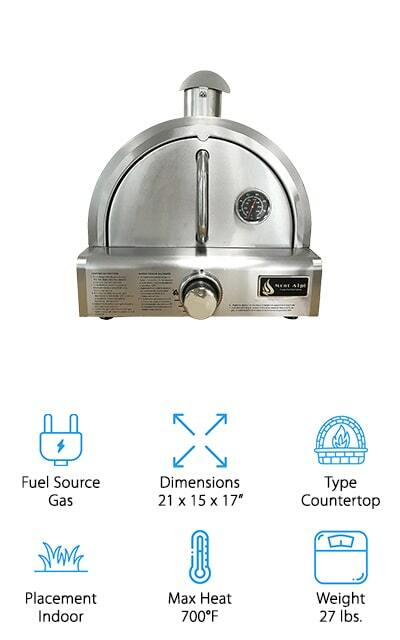 It cooks a 12” pizza with ease, providing a rotating surface and top and bottom heat elements. It also has a 30 minute timer to let you know when your food is ready. The cool-touch handle is made with stainless steel to make sure it’s always comfortable for you to open and it resists rust and other damage. The dials and the lights make it even easier to use wherever and whenever you want. These home pizza ovens are definitely close to what you’d find in a traditional version. It’s a clay oven that’s smaller than some other options but provides you with all of the wood-fired design that you want. It heats as high as you want, with no maximum heat level. It’s a little heavier than some options, but it’s great for the outdoors and has its own legs to stand on. 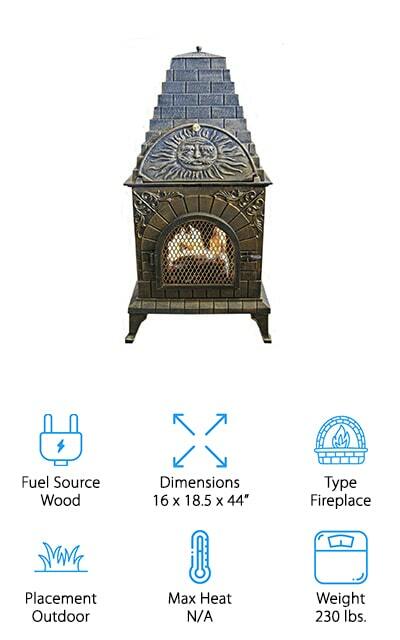 The metal stand makes it easy to set up where you want and you can even use this oven as a space heater if you need it. Here you’re getting something that you can definitely enjoy and that your family is going to love using for pizza night as well. It comes with a stainless steel pizza peel, rake and cover to make sure you’re ready to go.